We all love travels and trips, don’t we? When it comes to preparing your bag for a holiday or a getaway, no matter how well organized you make a checklist. You will always end up forgetting some essential product. If it’s a international holiday, You’d also have to take care of the amount of skincare bottles or tubs that you can carry on-board. It should exactly match to that of allowed skincare onboard as per your airline. Having all your skin saviours or favorites in under 100ml for the travel, Often it becomes difficult to pack everything you want. In this post, I am introducing a skincare set that is perfect for travels. 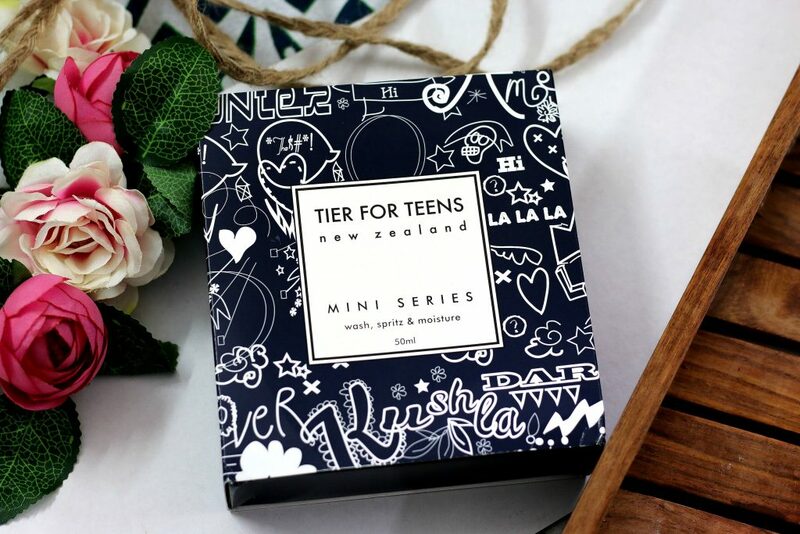 This “Mini Series” of ‘Tier For Teens’ skincare, exclusively made in New Zealand fits your handbag perfectly and these essentials come in generous 50ml bottles that is within airline permissible limits! Love how it’s packed in this cute paper case. TIER FOR TEENS range has been developed by NELLIE TIER which is targeted for young skin. It’s natural, hand-blended, pH balanced. Each product is PACKED with natures GOODNESS. 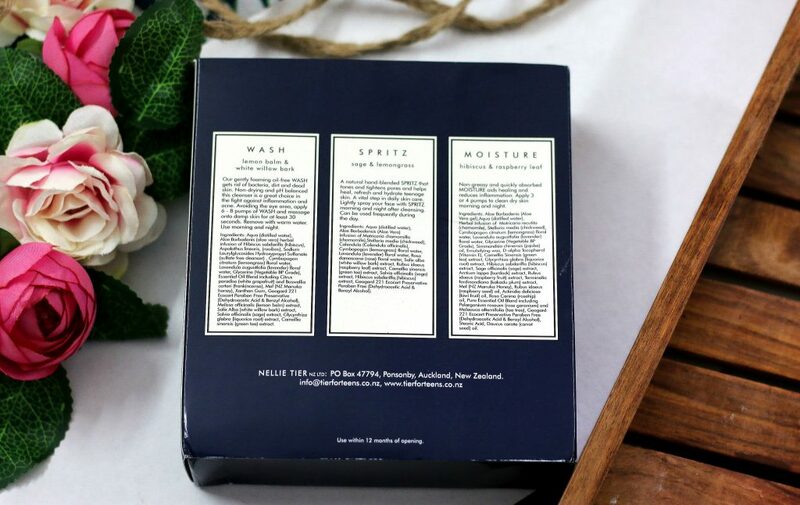 Botanical extracts, herbal infusions, and essential oils blend together in a gentle, healing and non-drying range that is free from sulphates, synthetic ingredients, pre-made bases, artificial coloring and fragrances. During my teenage days, I never had problems related to acne or any other skin related problems. It’s now when I approach thirties, most of the skincare issues such as breakouts, dark circles etc started to show up occasionally… So, I thought, Why not give this a try and see how effective it is in getting rid of my acne related issues. After all, all products are completely natural, So no harm in trying! Love the simplest packaging a lot! 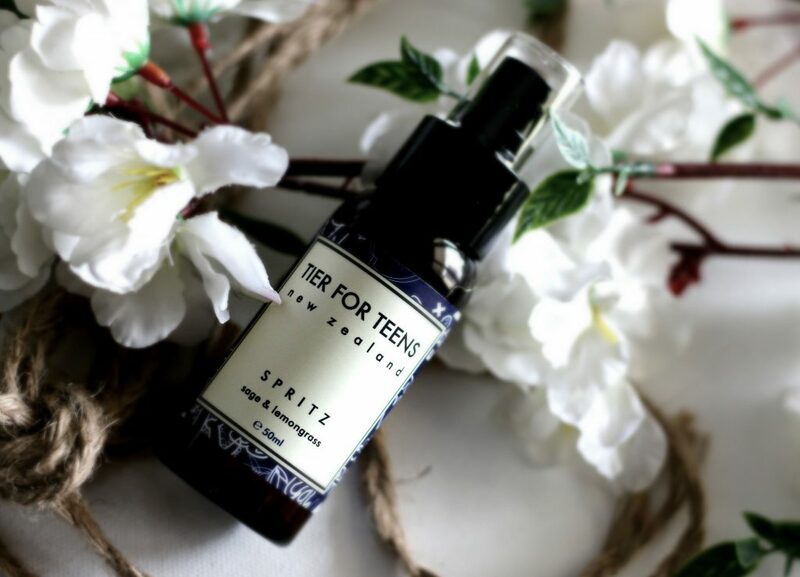 This would be one of the best Gift Parents can gift to their teenage children or If you are someone like me who is a obsessed about #naturalskincare. This is a great gift for yourself or your bestie who is equally skincare obsessed ! Also, #MadeInNZ makes it worth testing too. Tier For Teens skincare range is Free from sulphates, synthetic ingredients and pre-made bases, this natural hand blended, pH balanced range has been developed by the team at NELLIE TIER to meet the specific needs of young skin. 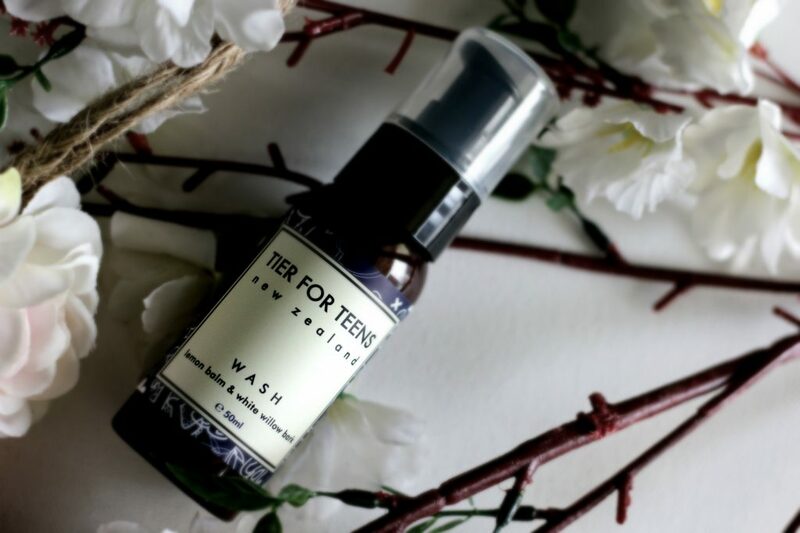 Tier For Teens Lemon Balm & White Willow Bark Wash is a natural, handcrafted, gently foaming gel that is oil free and perfect for washing away bacteria, dirt and dead skin. Gentle and non-drying this pH balanced cleanser does not strip the skin of its natural protective layer. It is a great choice in the fight against inflammation and acne. Aqua (distilled water), Aloe Barbadenis (aloe vera) herbal infusion of Hibiscus sabdariffa (hibiscus), Aspalathus linearis, (rooibos), Sodium Laurylglucosides Hydroxypropyl Sulfonate (sulfate free cleanser) , Cymbopogon citratum (lemongrass) floral water, Lavendula augustfolia (lavender) floral water, Glycerine (Vegetable BP Grade), Essential Oil Blend including Citrus paradise (white grapefruit) and Boswellia carteri (frankincense), Mel (NZ Manuka honey), Xanthan Gum, Geogard 221 Ecocert Paraben Free Preservative (Dehydroacetic Acid & Benzyl Alcohol), Melissa officinalis (lemon balm) extract, Salix Alba (white willow bark) extract, Salvia officinalis (sage) extract, Glycyrrhiza glabra (liquorice root) extract, Camellia sinensis (green tea) extract. How to Use and my thoughts: Avoiding the eye area apply 6 -8 pumps of WASH and massage onto damp skin for at least 30 seconds. Remove with warm water. Use morning and night. I really love how good it smell. The hint of Lemon Balm is very soothing and relaxing. This natural, lightweight oil-free cleanser is specifically formulated for oily, acne prone skin and helps clean and refine pores without irritation. It combines a carefully selected blend of essential oils with a potent group of high performance botanical extracts and a healing Aloe Vera herbal infusion. Lemon Balm tones and calms irritation. Lavender and Tea Tree fight infection, wild crafted White Willow helps unblock pores and get rid of dead cells and Green Tea and Frankincense encourage healing and help reduce the appearance of blemishes. Overall,This natural, lightweight oil-free cleanser is specifically formulated for oily, acne prone skin and helps clean and refine pores without irritation. It feels very relaxing after washing face using this. I use it at night after removing my makeup and double cleansing using my Foreo Luna. I massage it on to my face for 2-3 minutes every night. I suffer from headache sometimes and the smell of this is very relaxing for me. Even when sick, I never skip this. It gives that refreshed feel after washing. 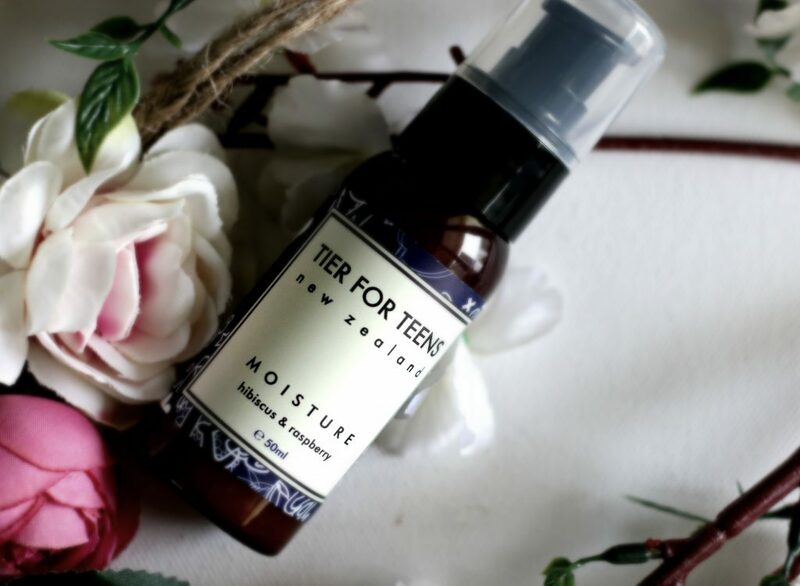 Tier For Teens Hibiscus & Raspberry Leaf Moisture is a natural, botanically based daily moisturizer is quickly absorbed, non- greasy and formulated specifically for young skin. It aids healing and reduces inflammation and will leave the skin feeling fresh and hydrated. Aloe Barbadenis (Aloe Vera gel),Aqua (distilled water), Herbal Infusion of Matricaria recutita (chamomile), Stellaria media (chickweed), Cymbopogon citratum (lemongrass) floral water, Lavendula augustfolia (lavender) floral water, Glycerine (Vegetable BP Grade), Simmondsia chinensis (jojoba) oil, Emulsifying wax, D-alpha Tocopherol (Vitamin E), Camellia Sinensis (green tea) extract, Glycyrrhiza glabra (liquorice root) extract, Hibiscus sabdariffa (hibiscus) extract, Sage officinalis (sage) extract, Arctium Iappa (burdock) extract, Rubus idaeus (raspberry fruit) extract, Terminalia ferdinandiana (kakadu plum) extract, Mel (NZ Manuka Honey), Rubus idaeus (raspberry seed) oil, Actinidia deliciosa (kiwi fruit) oil, Rosa Canina (rosehip) oil, Pure Essential Oil Blend including Pelargonium roseum (rose geranium) and Melaeuca alternifolia (tea tree), Geogard 221 Ecocert Preservative Paraben Free (Dehydroacetic Acid & Benzyl Alcohol), Stearic Acid, Daucus carota (carrot seed) oil. 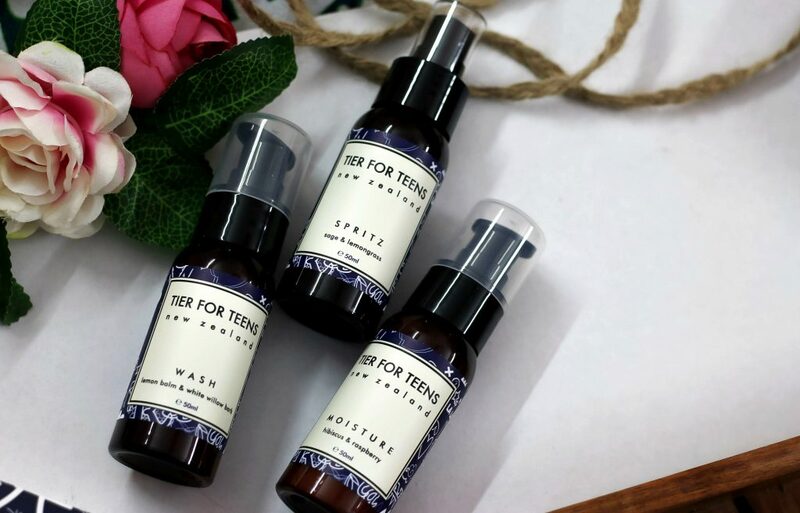 How to use and my thoughts : Apply 3 or 4 pumps to clean skin morning and night.Tier For Teens Hibiscus & Raspberry Leaf Moisture is a natural blend of infused herbs and botanical extracts. Rich in vitamins, anti-oxidants and anti-inflammatories this lotion is formulated to hydrate, calm and heal irritated skin. Raspberry leaf tightens pores and relieves irritation, Liquorice and Sage soothe and Burdock stimulates circulation. Green Tea and Aloe Vera heal and reduce inflammation and NZ Manuka Honey reduces scarring. Lemongrass balances the skin and Rose Geranium heals. Again, a fast absorbing moisturiser. Has the lemon oil fragrance which is very relaxing. Especially after using the face wash from the same range, this moisturiser really hydrates the skin. I don’t really know how moisturising it is on extremely dry skin. However, for oily and combination skin, This works great. It gets absorbed super quick and you may use it day and night. The pump bottle makes it easy to use and it dispenses the right amount every time. I love it!! Sage & Lemongrass Spritz is a hand-made, natural, healing blend of botanicals including chamomile, chickweed, wild crafted white willow bark, hibiscus, raspberry leaf and sage all work together to reduce inflammation and fight infection. Lemongrass helps balance the skin and minimize pores while lavender calms stressed skin and stimulates the growth of healthy cells. Green Tea provides strong support with antioxidant and anti-inflammatory properties. Lightly spray your face with SPRITZ morning and night after cleansing. Can be used frequently anytime during day and night. I just love the fragrance and it feels refreshing on skin. It didn’t irritate my skin either. During long flights, it’s really refreshing to spritz. Aqua (distilled water), Aloe Barbadensis (Aloe Vera) infusion of Matricaria chamomilla (chamomile),Stellaria media (chickweed), Calendula (Calendula officinalis), Cymbopogon (lemongrass) floral water, Lavendula (lavender) floral water, Rosa damascena (rose) floral water, Salix alba (white willow bark) extract, Rubus idaeus (raspberry leaf) extract, Camellia sinensis (green tea) extract, Salvia officinalis (sage) extract, Hibiscus sabdariffa (hibiscus) extract, Geogard 221 Ecocert Preservative Paraben Free (Dehydroacetic Acid & Benzyl Alcohol). Overall, I’m really impressed with the Tier For Teens travel skincare set. Just like the Parent brand Nellie Tier, all of the products are really good. All products are made of botanical extracts, herbal infusions, and essential oils blended together. Free from sulphates, synthetic ingredients, pre-made bases, artificial coloring and fragrances. They are a great size to try out the product before purchasing the bigger version that is 130ml size.Perfect size for travelling overseas, perfect birthday, Christmas gift too! 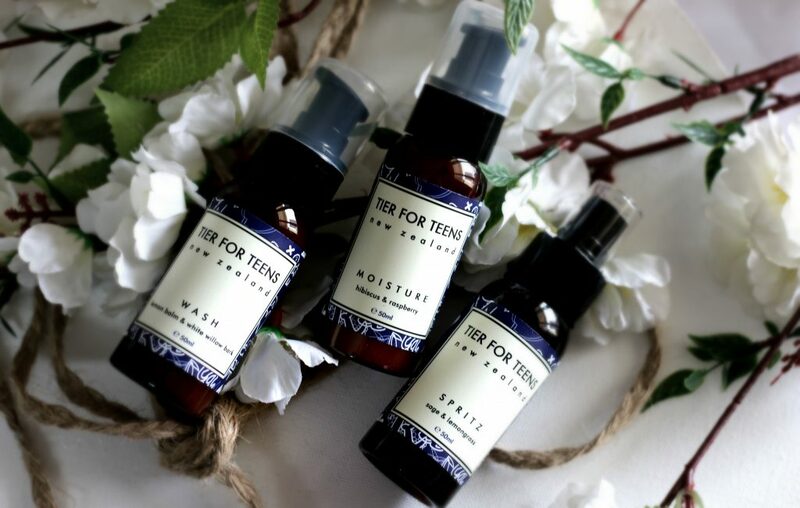 Have you tried Tier For Teens Skincare ? What are your thoughts ?